Stray Dog Theatre has compiled a delightful cast who takes on the deliciousness of this gut wrenching script which starts out innocently enough but soon escalates into a war of words that sets of a series of fighting, unusual alliances and ultimate chaos as these two couples (meeting for the first time) give an even worse name to bad behavior. Set in the upscale living room of the injured boy’s parents, Veronica and Michael, they have arranged a spotless environment- even a lovely vase of tulips that Michael has bought from a Korean flower seller to spruce up the already impeccable setting. 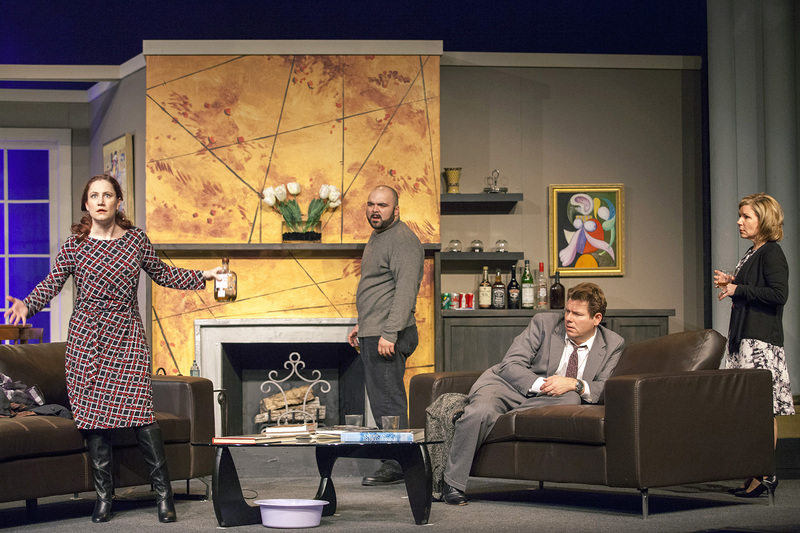 Rob Lippert, scene designer extraordinaire who has enhanced a lot of local stages, presents another winner that is strongly lit by the Tyler Duenow creations emphasizing the chic lifestyle. Into this lovely setting comes the opening volley by Veronica as she has written down a list of sins against Annette and Alan’s son and how he should “pay” for the reparations to their son’s image and psyche. As only Sarajane Alverson can deliver, she makes the surprising set of demands sound like honey dripping from Veronica’s lips. Her demeanor and smartly dressed and coiffed look can’t hide the anger rising in her as she reads the list for the first time out loud. This is no way to start a new relationship as she literally rakes their son over the coals for his actions. Throughout, she is a lynch-pin for the bad behavior that follows all four adults as they swirl downward into a cesspool of sarcastic barbs and vitriol. Michael Juncal plays her husband with a more reasonable outlook at first but he begins to vacillate as well as the game plan for the evening appears to be eroding. At times he agrees with his wife, at other times taking the side of one or both of the other parents. If there is a voice of reason in the evening, it is his- despite his denigration into the mischief that prevails. 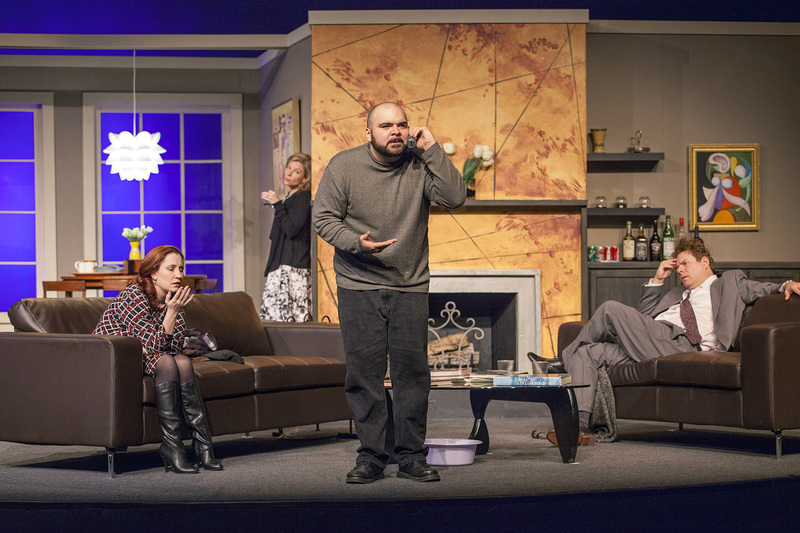 Another local favorite (both on stage and as a popular playwright), Stephen Peirick is the highly successful financial guru who is constantly answering his cell phone and shouting instructions to one or other of his lackeys on the other end. When called into play for distracting the group from the topic of the evening, he berates them for listening in on his phone conversations. Forget the fact that conversations in the room must stop because of the decibel breaking tone of his phone voice. This is a juicy role for Mr. Peirick and he makes the most of it. Finally, we get to see Michelle Hand- always a show-stopper as she does every little thing right as well as the large stuff to make her character of Annette someone you can’t take your eyes away from. Of course, she does get to steal the scene by throwing up on stage, but those subtle little moves that develop her character throughout make her a winner. From declaring they are leaving while slyly taking up the bottle of rare rum that has helped make the evening even worse to her brilliant flinging of the aforementioned tulips over her shoulder into the center of the living room highlight her wonderful, comic performance. Director Gary F. Bell has had a lot of fun with this one- you can tell by how polished and outrageously funny these four people are. He has gone right for the laughs and shown how ridiculously petty these couples can become over a perfectly ordinary, “boys will be boys” situation. Even though Veronica mentions how upset her son is, you can read this as her perception and not how he really feels (other than the pain of two broken teeth). 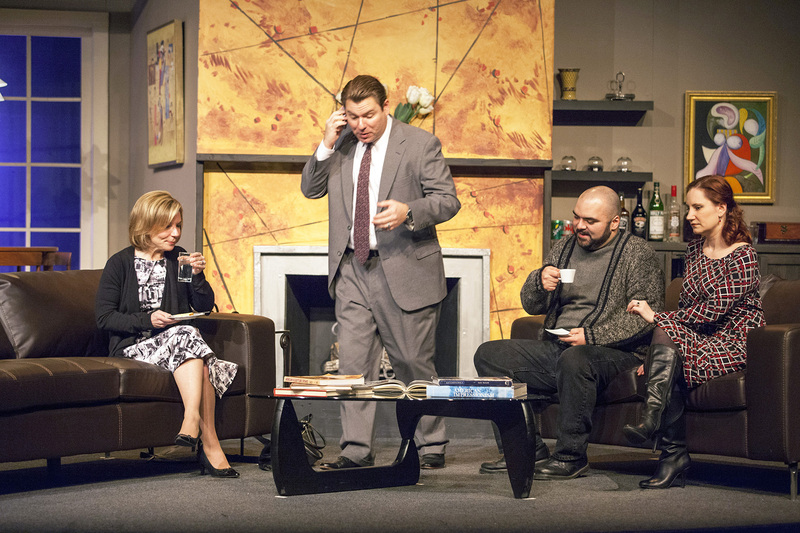 Playwright and jack of all trades in the theatre community, Christopher Hampton has translated Yasmina Reza’s brilliant script and, besides the accolades for the rest of the technical team already mentioned, a word of praise for Gary F. Bell who has pulled double duty as costume designer. 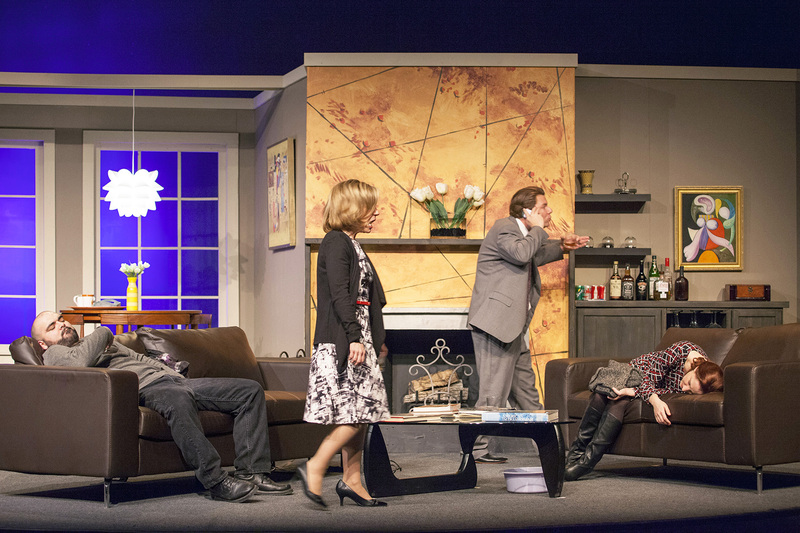 Tickets are going fast for “God Of Carnage” and many performances are already sold out. Give them a call at 314-865-1995 or at http://www.straydogtheatre.org for tickets or more information. 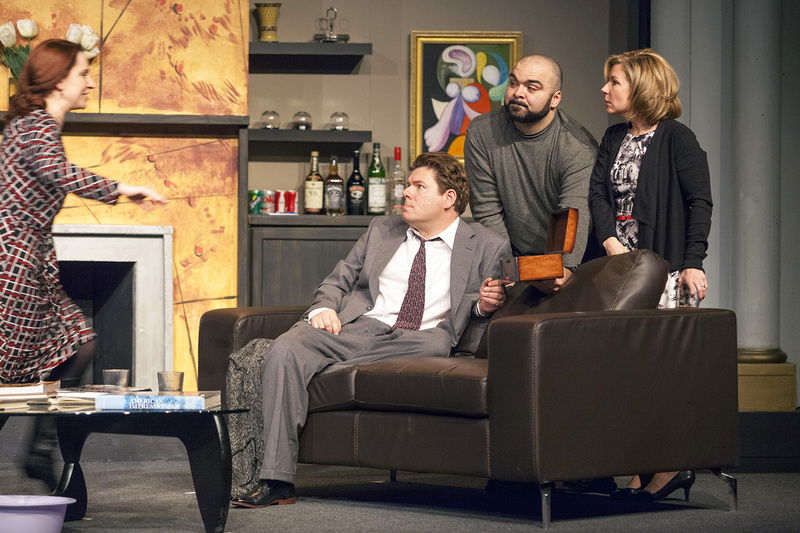 “God Of Carnage” plays through February 21st. This entry was posted on February 10, 2015 at 9:43 am02 and is filed under Uncategorized. You can follow any responses to this entry through the RSS 2.0 feed. You can leave a response, or trackback from your own site.